The national roundtable under the patronage of Minister of State for Women’s Affairs H.E. Jean Ogasapian and with the support of the European Union, took place on the 23rd of May 2018 at hotel Riviera, Lebanon. Click here to read the press release. It was organised by the Euromed Feminist Initiative and its members in Lebanon, the Lebanese Women’s Democratic Gathering and Association Najdeh. It gathered representatives of 13 ministries and institutions, 35 women’s and human rights organizations, as well as members of municipalities and women who had run for the parliamentary elections. 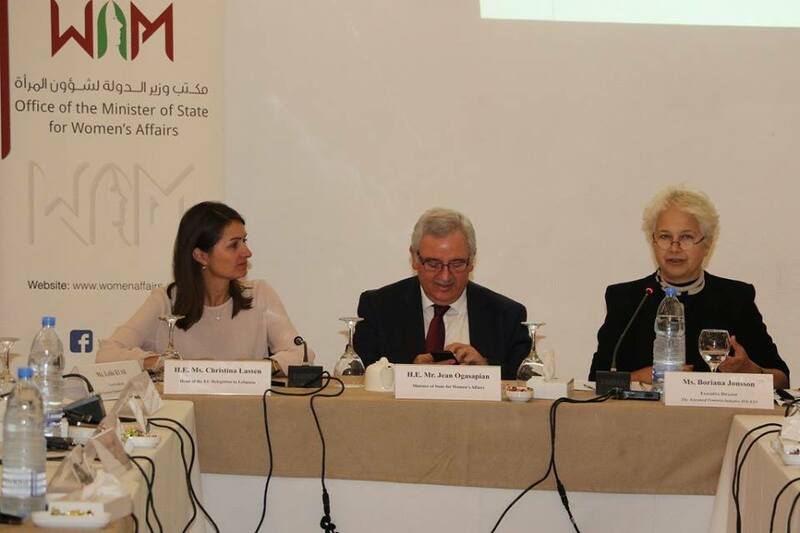 The event initiated a discussion with stakeholders on mechanisms to follow up on the implementation of the Ministerial commitments as a part of the regional process to follow up the 4th UfM Ministerial Declaration, led by Euromed Feminist Initiative and supported by the EU. Click here to view the photo album. The participants discussed as well the outcomes of the National Civil Society Forum held in April and agreed to submit their recommendations to the new government, national stakeholders and relevant ministries after finalizing them in an action plan.